On Sunday night I was watching 60 Minutes and one of their stories was Plan B and how FDA decdied that they were not going to allow Plan B to be sold over the counter. One of the reasons why FDA stopped Plan B from being sold over the counter was because many Catholic Churches and Cardinal Egan of New York believe that Plan B is an abortion pill but it's not. 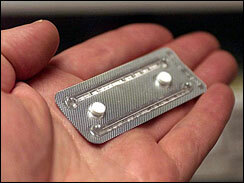 There is an abortin pill, RU-486 that a woman can take to stop a pregnancy to take place. Plan B is seen by doctors and by the medical soceity as a contraceptive. One of the other reasons why FDA decided not to approve Plan B was that young girls could buy it and use it. I believe the FDA made the wrong decision, its our decision if women want to take the pill and no one else's. I believe its our right to decide to take Plan B or not and the FDA need to realize that Plan B isn't an abortion pill but a contraceptive that can be used. I believe the FDA needs to rethink their decision and listen to women and not the church or any other official and decide from there to do the right thing.